Popular Smartphone retailer, 3CHub has redefined it's Celebration of the Valentine season. 3CHub has announced plans to host a dinner for two for its customers who buy from any if their outlets this Valentine season. 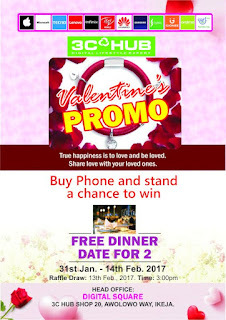 The promotion has been running from the 31st of January till the 14th of February. All any customer has to do is to buy any device from any of its outlets across the country to qualify for the raffle draw set to hold at its National Headquarters in Lagos, Nigeria. The raffle draw will hold on the 13th of February by 3:00pm. 3CHub is the leading lifestyle and digital expert with over 30 branches across Nigeria. The brand's passion to bring accessibility of devices, accessories and others have led it to keep reinventing itself and making its products affordable to the Nigerian customers.